WTI crude prices have dropped down into the $47.50-$48/b range this morning. 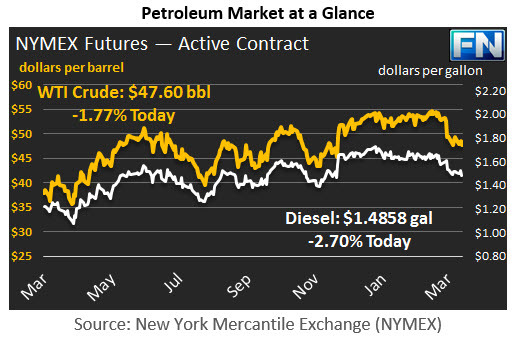 Yesterday brought a brief rally back above $48.50/b, based largely on news of continued OPEC commitment to production cuts, but prices dropped to close at $47.34/b. After hours buying brought WTI to an opening at $48.16/b today, an increase of $0.23 above yesterday’s opening. Since then, prices have waned. WTI prices are $47.60/b currently, down $0.64/b today. Diesel opened at $1.5025/gallon in today’s session. This was a decrease of 1.25 cents (0.83%) from yesterday’s opening price. Current prices are $1.4858/gallon, down 1.75 cents. Prices weakened when it was reported that crude oil inventories appear to be rising again this week, after a brief respite last week. Schneider Electric’s industry survey this week points to a crude stock build of 1.7 mmbbls. The API reportedly followed with its estimate of a 4.5-mmbbl addition to crude stockpiles. The Schneider Electric survey anticipates drawdowns of 1.75 mmbbls each for gasoline and diesel. The API expects drawdowns of 4.9 mmbbls gasoline and 0.9 mmbbls diesel. The EIA will release official data later in the day. Oil prices also are pressured by the overall drop in U.S. equities and falling prices for many key commodities. The Dow Jones Industrial Average collapsed by over 288 points yesterday, the largest daily drop this year. The U.S. stock market drop reverberated, and there were drops in stock markets in Europe, Japan, and Asia.